Remember recess as a kid? We would actually be forced to take a break from our multiplication tables to go play? Ahh yes ... those were the days. And what if during your break, you were greeted with a fluffy, adorable elephant named Stomper? Or a few members of the Oakland A's? That's exactly what happened when Aaron Brooks and Sean Manaea arrived at Vincent Academy in Oakland on Tuesday. The pitchers, along with Stomper, played some impromptu baseball with some of the students and it appeared they all had a blast. "It's a lot of fun," Manaea said. "To play with the kids at recess. It's something that I know when I was a kid would have been super fun." "One of the initiatives is to give back to the community and the A's do a really good job about setting things up." And for the record, a couple of kids took Brooks yard. And so the fun continued for another lucky school. On Wednesday, Brooks, and J.B. Wendelken visited Parker Elementary for another recess takeover. 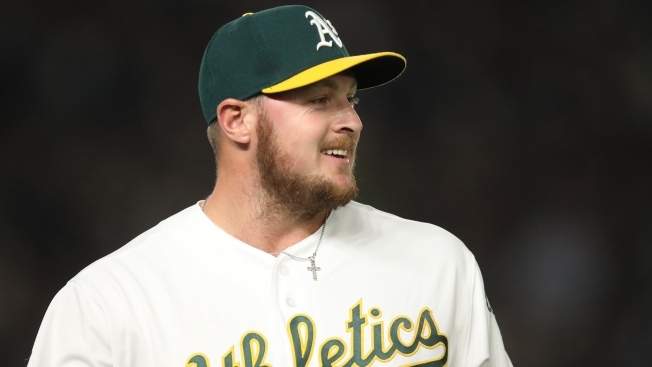 According to a press release from the A's, Parker Elementary is one of the team's partner schools through the Oakland Public Education Fund's Adopt and Oakland School program. Wendelken threw the fan a ball that was used during warm-ups, and he finished it off with a Happy Birthday wish on the photos of the big day. So cool. Nothing but class.